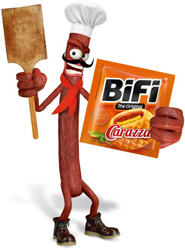 The BiFi Original is the delicious Mini Salami to take on the hunger between meals. BiFi will calm your stomach on road trips, at work, while playing football and anywhere else, where you get an indomitable hunger for a hearty and spicy sausage. 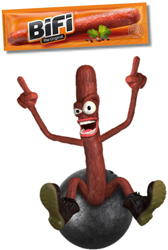 The original Mini Salami made from pork and beef! BiFi Hot is the challenge to your taste buds. 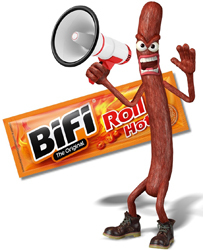 This juicy Mini Salami comes with an extra-hot chili flavour and has an extra fiery taste-kick. Don't say, we didn't warn you! The famous Mini Salami in the hot version! 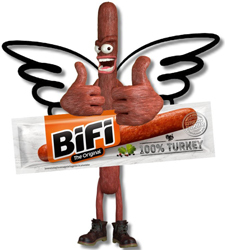 The BiFi Mini Salamis have grown wings. 100% turkey meat gives you the energy you need to hit the ground running and lift off. Buckle up and enjoy the flight! A sausage snack by BiFi - smoky, spicy, thoroughly delicious, from the best beef. 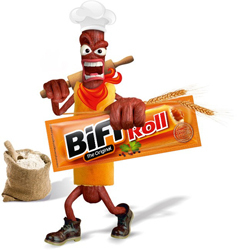 BiFi Mini Salami hidden in a crust of bread. Looks like a "Dog" waiting to be bitten by you. 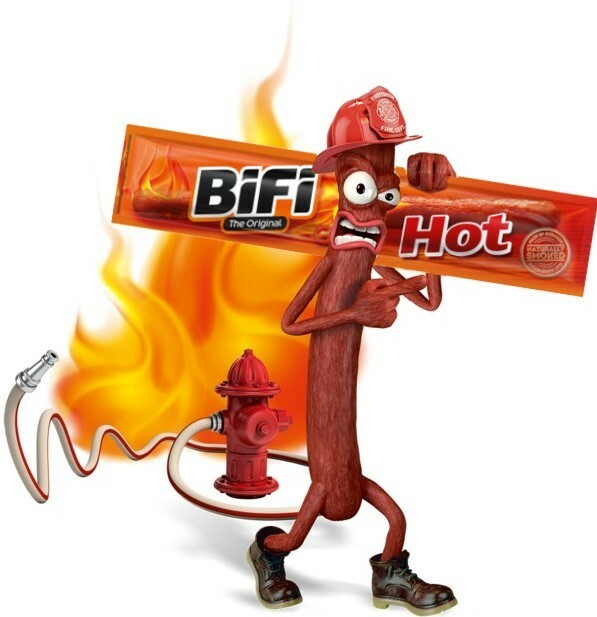 BiFi Original Mini Salami Hot Dog! BiFi Hot Mini Salami hidden in a crust of bread. Looks like a "Dog" waiting to be bitten by you. 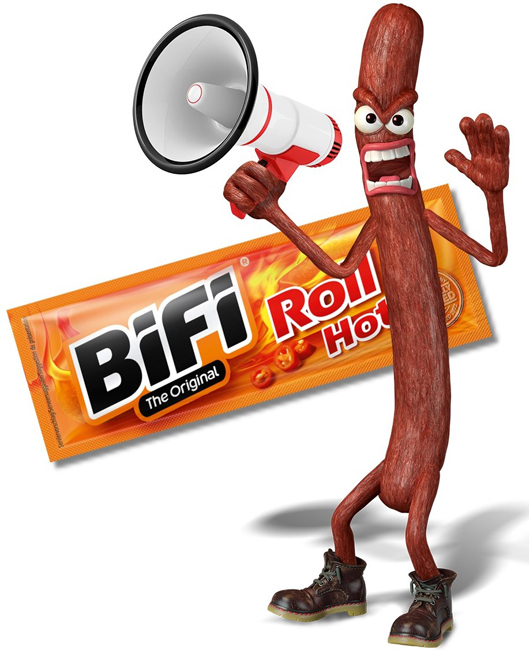 BiFi Hot Mini Salami Hot Dog! CIAO! My big brother has had Italy under control for centuries. I provide enjoyment with my Italian flair. Send your hunger back home and feel like you are at Mama's. BiFi Mini Pizza with salami, cheese and Italian Napoli sauce! The Texas-Pack with beef, beans and bacon. 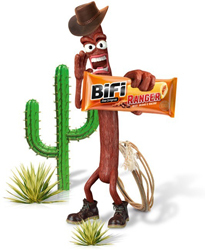 A piece of real Wild West in your pocket. Even Billy the Kid knew how to appreciate a good snack. Sliding hunger aside, give your horse the spurs and stand any adventure out there waiting for you. 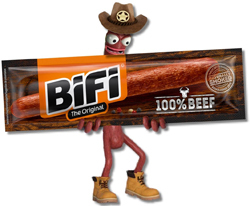 BiFi Western Burrito with beef, beans and bacon! 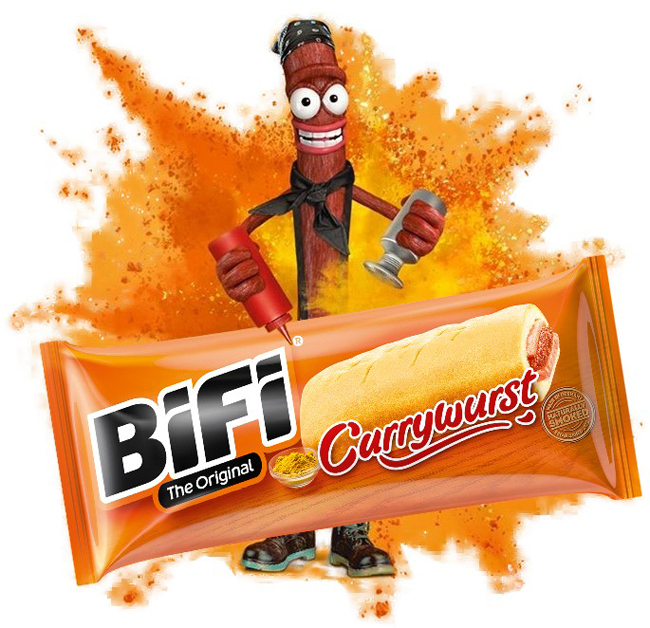 Who needs Sauerkraut, Weisswurst and 300 types of bread? - I'm the true German snack! BiFi Currywurst with salami and a curry tomato sauce!